My intention is not to go on a narcissistic rant about the merits of living abroad in a foreign country, but I do feel that there are some benefits and lessons to be learned. Sometimes, I think we all need to escape from the monotonous rat-race of our everyday lives and take a chance here and there. Well for me, the move to Finland has been a trip away from the safe harbors of my life in the Bay Area. Of course, I had some trepidation before making a move 5,000 miles across the globe an abandoning more than half of my material goods and renting a house about half the size of our home in California. Also, I knew going into this move that I would only have my current job for so many months, before needing to transition to a Finnish company. I haven't even mentioned the fact that I do not speak the local language nor have I stayed in Finland for a long, dark winter. I think really what I am trying to say is that sometimes in life one needs to step away from their comfort zones, walk out on that limb, take that chance and seek the unknown and undiscovered. We only go around once and don't want to live a life full of regrets, so Carp Diem! Traveling and living abroad is perhaps the best tonic for opening the mind to new cultures, attitudes, norms and different ways of doing things. Sometimes we find that we might walk down the same familiar paths in life and other times everything may seem so foreign and alien to us. Knowledge is power and a stagnant, unchallenged mind is not the path to personal enrichment. Of course, these are just my viewpoints and I am not attempting to cram them down anyone’s throats. I am merely expressing my opinion for believing in the power of opening the mind to change through travel. I don’t think the only key to happiness in life is a stable, rooted existence. I may have felt after hitting a milestone birthday recently and settling down in the beautiful city of Clayton, CA that my life was pretty much set in stone. While I miss my home and the many friendships made, I know that these next few years abroad can do nothing but enrich me and my family and open our minds and hearts to new experiences of a lifetime. I am also a firm believer that happiness doesn’t come from your residency, but it emanates from inside of you. I think that once one has truly found happiness and confidence within themselves, they can be truly happy living just about anywhere in the world. I am hoping that my children, currently aged 5 and 8 will take this experience living abroad in stride. They have found the schools to be not so much different from what they remember and have started to slowly immerse themselves into the new schools’ customs and traditions. My daughter is at an international school and has already befriended several girls who speak both fluent Finnish and English. There are also nationals from Germany, England, India, Mexico and several other countries represented at her school. I think this is a perfect opportunity to immerse her into the international culture of living in Europe. My son attends a Finnish speaking Montessori school and at first struggled to understand and speak Finnish but now is learning some phrases and has made several Finnish friends that he plays with on a daily basis. I have met many of the parents along the way and have found the world to be much smaller than I can imagine. In his Montessori school, I have encountered a Finnish couple who lived in USA for 20 years (about half their life) and have met other Finns who spent a few years in the USA. I have also encountered a Brazilian/Finnish couple and an American/Finnish couple. I am finding that even in isolated Finland, I see people from all walks of life. There is nothing better than exchanging cultures, ideas and traditions with folks across many different nations. I spent my first Christmas ever away from my family and friends in the Bay Area. While this was bittersweet, I welcomed the Finnish Christmas experience. The Finns do celebrate Christmas a little differently from what we are used to in the States, but overall they practice many of the same traditions. One almost "sure thing" that normally occurs in Finland is a "White Christmas". However, they must have known I was coming from California, because it has been nothing short of near record warmth. There was no snow in sight for Christmas in the Southern Finland area, in fact the 2 days after Christmas have been 46-49 degrees Fahrenheit. That might not seem exactly balmy, but in Finland which is about the same latitude as Alaska it is downright hot for this time of year. Most Finns get their tree on the day before Christmas and many of them just cut a tree down in a local forest. In Finland there is a law that all forests are public, even if someone own the land, others may roam freely across, picking berries or even cutting trees down. Of course this is different from owning a house with yard. Also in Finland, I have not noticed the overblown ostentatious lighting systems in people's yards that you see all over the Bay Area. People seem to keep their lighting down a minimum, that gets back to the fact that people in Finland are never trying to stand out above the rest. Showing off is a language that they don't seem to speak. The Finnish traditional Christmas meal consisted of a salt-cured ham, potato, carrot, liver and rutabaga casseroles. Also, carrot, beet and pickle salad (yum! ), smoked salmon, Karelian pies and rye bread. For me, Finnish food has been an acquired taste, but I think I am slowly getting used to it. They have two spices in their vocabulary, that is salt and pepper. The main day of Christmas in Finland is Dec. 24th, this is the day that most families open their gifts. Also many families either rent a Santa or their dads dress up in Santa suits and deliver the gifts early evening on the 24th. December 25th, traditionally known as Christmas day in the States, is merely a day of rest in Finland, as is the 26th another Holiday in Finland. Stores are essentially closed on both the 24th and 25th and open for limited hours on the 26th. People are not known to have those lavish American style huge Christmas dinners in Finland. They normally prefer a small celebration with immediate family and they do take their relaxing seriously. Christmas to the Finns should not be a place to get stressed out about going to 3 parties and preparing loads of food for everyone. Overall, though I missed my large family celebration in the Bay Area, I actually liked the mellow Christmas experience just being around immediate family and taking the time to really relax. The difference between the weakest and strongest students in Finland is the smallest in the world. “SINCE IT implemented huge education reforms 40 years ago, Finland’s school system has consistently come at the top of international rankings for education systems. It’s simple — by going against the evaluation-driven, centralised model that much of the Western world uses. 2. They rarely take exams or do homework until they are well into their teens. The children are not measured at all for the first six years of their education. 5. 30% of children receive extra help during their first nine years of school. 6. 66% per cent of students go to college. 7. The difference between the weakest and strongest students is the smallest in the world. 8. 93% of Finns graduate from high school. 9. 43% of Finnish second-level students go to vocational schools. 10. Teachers only spend four hours a day in the classroom, and take two hours a week for ‘professional development’. 11. The school system is 100% state funded. 12. The national curriculum is only a broad guideline. 13. All teachers in Finland must have a master’s degree, which is fully subsidised. 14. Teachers are selected from the top 10% of graduates and their average starting salary in 2008 was $22,235. Last year, 6,600 applicants vied for 660 primary school training positions. 15. High school teachers with 15 years of experience earn 102% more than other college graduates. OK, I realize that I might have been a little bit harsh on Finland in my first post, but that wasn't the point. 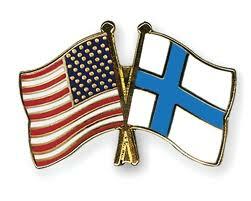 I actually find that there are many differences between the United States and Finland and many of those favor Finland. There are many things that work beautifully in a social democracy such as Finland. These are among the top items in no particular order or ranking. 2. Recycling - Since moving to Finland, I have been astonished at all the different items that people actually take the time to recycle. There are separate bins for biodegradable, paper items, regular garbage, cans and bottles, batteries, etc. I think it really works because there is actually a much bigger incentive to do it. Large bottles and smaller bottles are 20 and 40 cents (Euros) and since that price is included in your purchase, you would end up losing a lot in the long run if you didn't bother to recycle. Even cans are worth 15 cents each in Finland. In the US the amount of money is so little that most people just leave their cans and bottle out to the curbside or throw them away in the garbage can. Whazzup United States - where is the incentive! 3. Environment - Finland seems to have much stricter rules on all things related to the environment. Clean water, clean gas, clean factories, etc. There is a reason why gas costs so much in Finland. The higher gas standards and environmental regulations all fit into the bigger picture. Your tax dollars are put to good work in Finland. I don't mind paying a bit more to live in a "clean" society. 4. Access to free Healthcare - This one is a gargantuan. Can you imagine in the US if everyone had access to free healthcare and it had nothing to do with your job? :) Well that is a reality in Finland. You only have to be a citizen or resident and you simply get Healthcare for free. The workforce doesn't get any special privileges to different levels of healthcare in this system. It is really for everyone and it seems to work. I haven't heard any stories about people waiting in line for hours or other propaganda you might hear on US television regarding healthcare in more socialized societies. 5. Access to free Universities - Another great benefit of living in Finland. Everyone has access to the Universities and they are essentially free. Of course you must get admitted to them, but they even have "open Universities" for those wishing to simply drop in. I have met many people who essentially came to Finland to take advantage of the education system. So, finally starting a blog after much thought. I moved to Finland last summer with my family from the United States. The adjustment hasn't been all that bad so far, but I wanted to start my first post with a few thoughts on differences between living in the US and Finland. Please forgive the stereotypes, these are just observations! 1. Gas cost! - Not only is gas 2-3x more expensive in Finland that the US, the gas here 95 octane E10, etc. gets much worse gas mileage (miles per gallon for US folks). So, not only do you pay more at the pump, you pay in lost miles (kilometers). 2. Parking and roads - OK, well this one might not be as obvious as the gas one, but I notice that almost all the roads (not highways) are narrower than in the US and parking spots barely fit a standard 4-door car like my Camry. Forget your big American SUV or Escalade, it won't really work in Finland. 3. Home sizes - An obvious one - with the Finnish winters, the last thing they want to do is worry about heating that 3,000 Square foot mansion like those folks in the US have. Homes are generally smaller in Finland, but it makes sense. 4. Car bureaucracy - You had better think twice about shipping your US car to Finland. Going through the hoops is a small nightmare. First of all, you must make sure it clears customs and get your temporary plates. Then you must take it to this place to have it checked to make sure it passes for Finnish standards. They will charge you $275 Euro for a simple 45 minute test while others taking their cars for checks only get charged like $50 Euro. Then after it passes, you must find a car shop to have the appropriate changes made - add fog lights, blinkers, etc. Finally - you can wait for the tax assessment from Customs to be made and if you clear that you can finally get your plates and you officially have a car to drive legally in Finland :) The whole process takes like 3 months and will cost you around $1,000 Euros not including Winter tires that you will soon need if staying for the winters. Good luck! 5. Finnish Customer service - What customer service? Nah, actually it is not that bad, just takes some time to get used to. So, in most Finnish restaurants, shops, etc. have only a few folks working at them (with some exceptions) compared to what you may be used to in the US. If you need something you normally need to ask them and they hope they are in a good mood. :) Things are just a bit slower, and they don't take as much joy in serving you. Not a customer focused society. However, with that said I found an awesome guy to help me service my cars at this shop in Espoo. He has been more than helpful getting the cars up to standard. 6. Eye contact & small talk - I think this one is also pretty well known. In US even walking down the street you will easily find people smiling and greeting you when you come by. In Finland, these daily greetings normally do not occur as people are generally more introverted and shy in public situation. Give them alcohol and it might be another situation though. :) Any Finns reading this - please except my apologies for the stereotype.